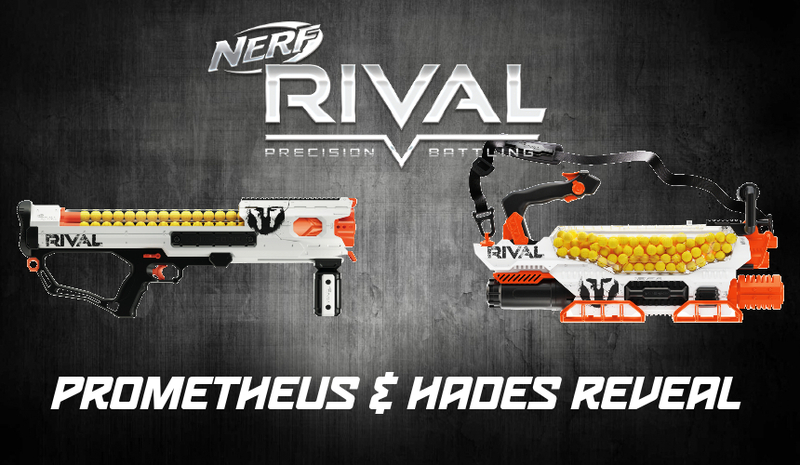 Nerf Rival Prometheus & Hades Press Release! As expected, this time of year is full of new product announcements, spread out among various media outlets, followed by general press releases. Today, Popular Mechanics showed off the newest blasters in the Rival Phantom Corps line. I’ll list the official press releases, and the my thoughts. The Prometheus is simply going to be a large blaster, there’s no way around it. 200 balls, using a minigun-style handle and sling? Having a rechargeable battery by default is at least a nice consideration, both for weight and the expense of using alkaline batteries. I still think there’s a bit of Hasbro biting off more than it can chew, though. The Nemesis started off at $100, then dropped down a nice percentage as Christmas approached (with some stores even doing half off sales). A $200 blaster takes up a lot of shelf space, and needs to move a lot of inventory to justify its continued existence. Will it be fun to use? Of course it will. But for what it is, I could easily imagine needing a price reduction before sales take off. On a side note, I imagine most people in the modding community will, aside from tearing one apart for learning things, will stick with a Nemesis and just expand the hoppers. The Hades, meanwhile, is simply an Artemis with double the capacity. 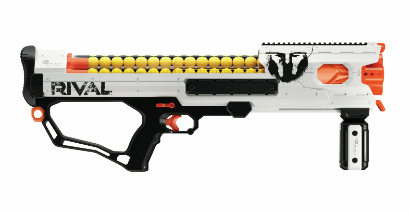 (Reminds me of a certain video from Out of Darts) The Artemis is a great handheld blaster with capacity and range, and having a “full” blaster with stock and more balls in storage will be nice. I’m personally more excited for the Hades. Stay tuned; I’m sure more blaster news will be dropping in the coming days! 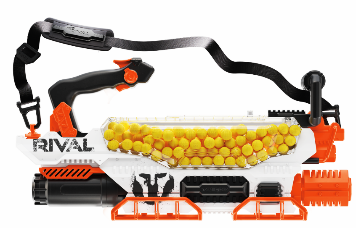 This entry was posted in Dart Blasters, News/Updates and tagged 2018, hades, hasbro, nerf, news, prometheus, rival, toy fair on January 24, 2018 by BuffdaddyNerf. I myself released a video on these two. IMHO, the Prometheus looks amazing, and the Hades too. BRING THESE IN BLUE HASBRO! I am (In a way and pardon me for saying so) sick of all the phantom corp blasters. I just want the standard blue and red rival blasters. Hasbro has a recent stigma of overcharging for their toys. Like their BB8 Playset that was like $200 too. Way too much. I could see this blaster being worth $150 at retail. It’s big, lots more plastic, lots of moving pieces and lots of ammo. I, for one, cannot spend $100+ on a Nerf gun, the powers that be would have my head, but it is fantastically cool and I hope to see one in action. Check out the link to the Popular Mechanics article reveal. They have video of it in action and it looks pretty wild.